For those who like the simple approach, the Courageous is a no-frills waterproof jacket with retro styling, armor, back padding and a comfortable insulating liner. 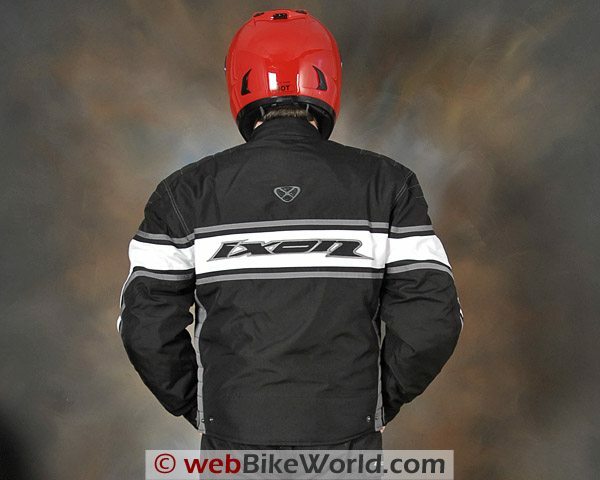 Ixon motorcycle clothing and products are distributed in many regions of the world and the brand is very well known in Europe. There’s an Ixon distributor in Canada, but alas, none in the United States. This is a shame, because more choices are always better for motorcyclists. And Ixon isn’t one of those tiny little companies with a postage stamp size catalog, either — they have an absolutely huge lineup of clothing. As an example, the Ixon men’s textile jacket collection has an astonishing 54 different combinations of styles and colors. Ixon also has a complete line of motorcycle clothing for women, with 30 different textile jackets and 4 different types of pants! Ixon even has a children’s line of motorcycle clothing for both boys and girls — a rarity in the industry because the sales and profit margins are as tiny as the customers. We were able to procure one of the very nice Ixon “Los Angeles” kid’s jacket for a review, and a local youngster is evaluating it for us, so stay tuned for his report. 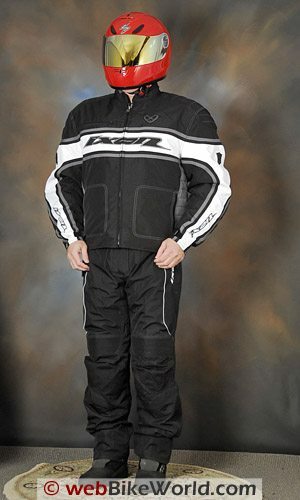 And plus-sized motorcyclists take note: In addition to their expanded size range for many of the garments, Ixon has a “C-Sizing” line of clothing for both men and women, with sizes ranging from XXL all the way up to — get this — XXXXXXXL! That’s 7XL, a size I never even knew existed, and probably just right for The Big Show to wear when he’s out cruising on his Boss Hoss! Ixon was started in France just 12 years ago, but they’ve become a powerhouse in the industry, with motorcycle products ranging from street clothes to leather racing suits, and including a huge line of gloves (33 at last count); motorcycle accessories; rain gear; off-road clothing; cold weather gear; underwear; and even luggage (see our review of the Ixon X-Pand Motorcycle tank bag). I’ve been reading the Ixon advertisements in British motorcycle magazines for years and have always wanted to learn more, and we were finally able to get a sampling of Ixon products to evaluate. So you’re probably wondering why this is one of the largest motorcycle clothing manufacturers you’ve never heard of? Beats me…who knows what strange evils lurk in the international distribution channels for motorcycle gear? Canadians can buy Ixon products, and they’ll ship over the border if you’re willing to pay, but why hasn’t anyone in the U.S of A. picked up the line? 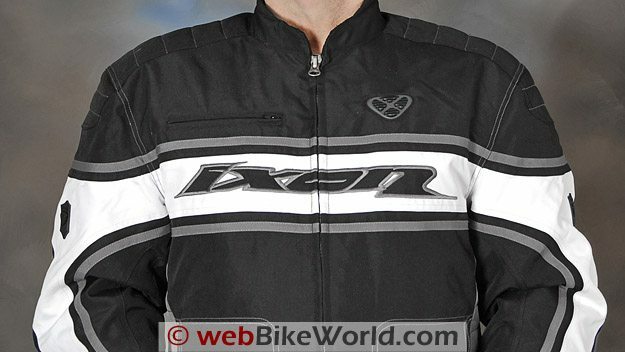 Besides the huge and varied product line, which is offered in some of the widest range of sizes in the industry, Ixon is known for good quality motorcycle clothing at reasonable prices. There’s pretty much something for everyone in their catalog, so take your time and choose wisely. They use the latest modern materials and manufacturing techniques, along with their “Arron” branded CE-approved armor which is tested in independent labs and meets all current European standards for protective clothing. Each item comes with a CE label that lists the specific tests and standards that the product meets. We’re very thankful to Thunderchild, the UK distributor for Ixon and several other brands, who sent us the Ixon “Courageous” jacket, “Climber” pants, the just released “RS King” gloves (review coming soon) and the “Los Angeles” children’s jacket (ditto). And here’s a bonus: just by coincidence, webBikeWorld contributor Kevin Gould sent us his impressions of the Ixon “Ambitious” pants for good measure! Enjoy! The Ixon Courageous jacket and matching Climber pants. With so many different choices on their website, finding a favorite item can be difficult until you learn the Ixon system. Apparently, rather than giving the products a numeric or acronymic label, Ixon turned to whimsy. Customers can choose from products with names like the Courageous, Victorious or Ambitious pants; the Fearless, Celtic or Famous leather jackets; and the Spiral, Comet or Pro Globe gloves. Strange maybe, but surely better than, say, “E 4502 H”, which is their internal product code for the Climber pants! Each Ixon clothing item is in one of 3 categories: Performance, Active and Essential. 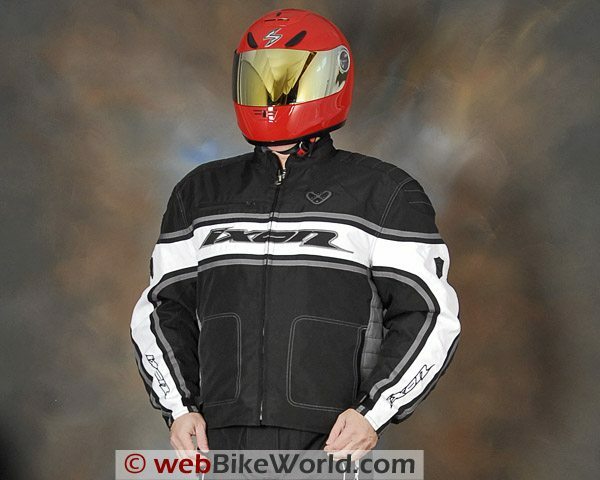 The “Performance” line incorporates Ixon’s most technologically advanced (“high-end”) features, while the “Active” line has a good selection of features at a slightly lower price point (mid-range) and the “Essential” line is their basic line of motorcycle clothing. While one might conclude that anything less than the Performance category may not be worthy of attention, that isn’t necessarily the case. Each product has a specific feature set designed for a particular use, which allows the individual to decide exactly which item meets their needs without “overbuying”. Remember — more choices are better, right? The Courageous jacket is new for 2008 and for some reason it doesn’t yet appear on the master Ixon product list, but I believe it is from the Ixon “Active” category. The jacket is listed on the Clary Sports (the Canadian Distributor; see the Summary Table below) website however, with a brief description that tells us the Courageous jacket is a “Retro styled straight cut jacket” that’s “100% waterproof”. The Courageous jacket connects to the Climber pants and has a comfortable and removable quilt lining. As is the case with most Ixon motorcycle clothing items, the Courageous is available in an expanded size range, from XS to XXXL. I have a confession to make: sometimes I crave the simple life. I fantasize about selling off the current stable and getting something like a Suzuki DR650SE thumper or a KLR650. One pair of boots, one pair of gloves, a jacket and pants. And one helmet, of course. It just seems like that would help me feel more in control of life. Ah well — probably not, human greed and ambition being what it is! 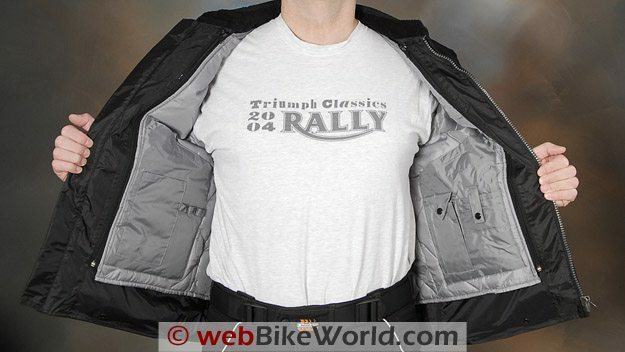 But simpler is sometimes better when it comes to motorcycle clothing. For one thing, it means there’s less to go wrong. That’s where the Ixon Courageous jacket (and Climber pants) come in: they prove that less is more. The jacket looks simple but does include some fairly high-tech features and it has actually proven to be an excellent choice for cool-weather touring. It’s comfortable as heck, for one thing. I think it’s the way the jacket is cut. Ixon says it’s a “straight cut”, and it’s more like a casual street jacket than a tight motorcycle garment. 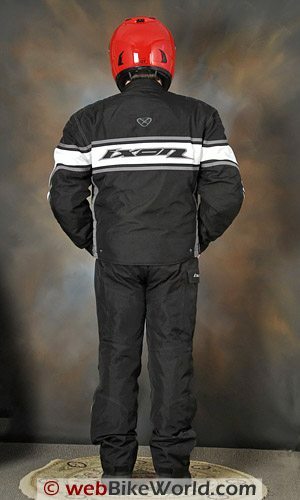 While this may not offer track-ready safety, it’s made from a special “Noxilen” fiber, designed for abrasion resistance with light weight — the jacket weighs only 1,701 grams (3 lbs., 12 oz. ), about as much as a motorcycle helmet. The light weight is part of the comfort factor, and makes up for the lack of vents. That’s right: the Courageous jacket has no vents at all, but wearing it during a couple of weeks of cool, wet fall weather, it didn’t need them. I never thought I’d say that, because I’m usually the guy still wearing perforated clothing into winter. But, I don’t usually open my jacket vents when the weather gets cold, so I guess this jacket saves me the trouble. At least the lack of vents means less worries about the potential for leaking! It also helps keep the Courageous jacket more wind resistant. Apparently the “Dryaxx” waterproof/breathable liner and the Noxilen fibers do their job. I’m not sure I’d want to wear it in a sticky Mid-Atlantic summer, but it’s not designed for that. This is a fall and light winter jacket that works very nicely for touring. It looks great too, with the contrasting white retro stripe and the white stitching around the pieces and pockets, which help break up the black. Slide out the removable Arron CE-approved armor in the elbows and shoulders (and relatively thick padding in the back) and the Courageous jacket could easily be worn on the street. The outside of the jacket includes two zipped hand pockets that are covered with a hook-and-loop cover. The pockets appear to be waterproof. There’s a horizontal zipped pocket on the upper right chest that also seems to be waterproof. It’s deep, at 155 mm (6″), and it will hold a large wallet. I discovered that it’s also a handy place to store an ID badge for easy access when needed. 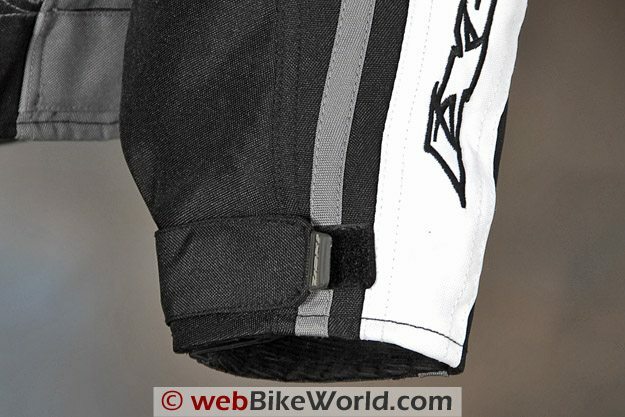 The sleeves are pre-curved, which also add to the motorcycle comfort factor. Ixon made a “Why aren’t they all like that?” move by leaving the bottom of the sleeve liner a few centimeters short of the end of the cuff. The liner attaches to the inside of the jacket with a couple of loops and snaps, but leaving it slightly short allows the sleeve cuff to be stuffed very neatly into a pair of gloves, like the Ixon RS King gloves, with their nice, big gauntlets. The cuff has a simple hook-and-loop adjuster and the sleeve is darted to wrap snugly around the wrist. The tip of the hook-and-loop closure has a handy little rubber pull tab, which makes it very easy to adjust the sleeve when wearing gloves. The inside of the cuffs are very nicely finished in a soft corduroy, a nice touch. The neck also has a 35 mm tall swath of corduroy lining, topped by a very soft “skin peach velvet”, as Ixon calls it, on the tubular-shaped edging. Again, all this just adds to the comfort factor, making it a relaxed, gentle jacket. The removable insulating liner is silky and puffy, and it feels great. It attaches with zippers on either side of the placket in addition to the double loops and snaps at the sleeves and one at the top of the back of the neck. Although the temperatures have been getting cool, it’s not winter, so I can’t comment on wearing the jacket in sub-freezing temperatures. But I have worn the Courageous jacket in temperatures as low as 10 C (50 F) in damp and light drizzle conditions, with only a T-shirt underneath and I felt perfectly cozy. The liner does have an interesting feature: it has more pockets than I’ve ever seen before in a motorcycle jacket. This is a real commuter special, with large, wide, deep (255 mm) pockets on either side of the liner. Attached to the front of those cargo holders are a cell phone pocket with snap flap on the left, and an array of three business card holder pockets on top! Yep – you can slip in a bunch of business cards and strap ’em in with a length of fabric that snaps over the top to keep them secure. Never saw that one before! On the outside of the right cargo pocket lives another long and narrow open pocket with a separate three loops designed to hold pens or pencils. Ixon may figure the Courageous jacket to be the business person’s commuter special I guess! The jacket also has a short zipper attachment on the inside that matches the Ixon Climber pants and probably others. The liner is cut so that the zipper can be attached to the pants with the liner installed. Finally, the waist has a three-position snap for adjustment around the bottom. The rear of the jacket is extra long, as you can see in the photos; it covers almost all the way down to the bottom of my rear. Thunderchild sent a Courageous jacket in size 2XL with a note “not to be scared” about the seemingly large size label, but I do think both the Courageous jacket and the Climber pants are slightly large, perhaps one size too big for my 43″ chest and 30″ inseam. The slightly larger sizing makes the clothing even more comfortable, but I could probably get away with the next smaller size. Based on this example, I’d say the 2XL would fit a 44″ to possibly a 46″ male chest, so the 2XL is probably equivalent to an XL in “normal” sizing. The Ixon Courageous jacket is a basic no-frills cool-weather waterproof short jacket. It’s not loaded with features that may or may not prove useful, depending upon the circumstances; instead, it’s actually a rather focused jacket, when you think about it. But instead of being focused on, say, sport riding or track day use, with the compromises that may bring, it’s focused on cool- or wet-weather riding with comfort. Remember that the Ixon strategy involves offering a large array of styles and features so that each motorcyclist can pick and choose a product to meet their needs. All I can say is that in the cool fall weather we’ve been experiencing, I didn’t miss the vents, which was surprising. I do like the simplicity and excellent comfort of the jacket and I like it’s looks. It’s also a perfect match with the Climber pants, which are also waterproof and lined. This makes a very nice touring outfit that shouldn’t bind or pinch the rider who isn’t fond of tight-fitting race-oriented gear.